Earth's Atmosphere Is The Oxygen We Breathe. Earth's atmosphere is made of gases and allows us life on Earth. Earth's atmosphere is a layer of gases surrounding the planet Earth. Earth's atmosphere is retained by the Earth's gravity. Earth's atmosphere contains roughly 78% Nitrogen, (normally inert except upon electrolysis by lightning and in certain biochemical processes of nitrogen fixation), 20.95% Oxygen, 0.93% Argon, 0.04% carbon dioxide, and trace amounts of other gases, in addition about 1% water vapor. This mixture of gases is commonly known as air. The Earth's atmosphere protects life on Earth by absorbing ultraviolet solar radiation and reducing temperature extremes between day and night. Layers of Earth's Atmosphere - not to scale (NOAA). There is no definite boundary between the Earth's atmosphere and outer space. The Earth's atmosphere slowly becomes thinner and fades into space. Three quarters of the Earth's atmosphere mass is within 11 km of the planetary surface. In the United States, people who travel above an altitude of 80.5 km (50.0 miles) are designated Astronauts. An altitude of 120 km (75 miles) marks the boundary where atmospheric effects become noticeable during re-entry. The Karman line, at 100 km (62 miles), is also frequently used as the boundary between atmosphere and outer space. Temperature and the atmospheric layers of Earth. troposphere: From the Greek word meaning to turn or mix. The troposphere is the lowest layer of the atmosphere which begins at the surface and extends to between 7 km (4.4 mi) at the poles and 17 km (10.6 mi) at the equator, with some variation due to weather factors. The troposphere has a great deal of vertical mixing due to solar heating at the surface. This heating warms air masses which then rise to release latent heat as sensible heat that further uplifts the air mass. This process continues until all the water vapor is removed. In the troposphere, on average, temperature decreases with height due to expansive cooling. stratosphere: from the troposphere's 7-17 km range to about 30 km, temperature increases with height. The stratosphere contains the ozone layer. The ozone layer is the part of the Earth's atmosphere which contains relatively high concentrations of Ozone. "Relatively high" means a few parts per million-much higher than the concentrations in the lower atmosphere but still small compared to the main components of the atmosphere. It is mainly located in the lower portion of the stratosphere from approximately 15 km to 35 km above Earth's surface, though the thickness varies seasonally and geographically. mesosphere: from about 50 km to the range of 80 km to 85 km, temperature decreasing with height. thermosphere: from 80 - 85 km to 640+ km, temperature increasing with height. ionosphere: is the part of the atmosphere that is ionized by solar radiation. It plays an important part in atmospheric electricity and forms the inner edge of the magnetosphere. It has practical importance because, among other functions, it influences radio propagation to distant places on the Earth. It is located in the thermosphere. exosphere: from 500-1000 km up to 10,000 km, free-moving particles that may migrate into and out of the magnetosphere or the solar wind. The boundaries between these regions are named the tropopause, stratopause, mesopause, thermopause and exobase. The average temperature of the atmosphere at the surface of Earth is 14 ºC. Pressure and thickness of the Earth's Atmosphere. Barometric Formula: (used for airplane flight) barometric formula. One mathematical model: NRLMSISE-00. The average atmospheric pressure, at sea level, is about 101.3 kilopascals (about 14.7 pounds per square inch). Atmospheric pressure decreases with height, dropping by 50% at an altitude of about 5.6 km (equivalently, about 50% of the total atmospheric mass is within the lowest 5.6 km). This pressure drop is approximately exponential, so that each doubling in altitude results in an approximate decrease in pressure by half. However, because of changes in temperature throughout the atmospheric column, as well as the fact that the force of gravity begins to decrease at great altitudes, a single equation does not model atmospheric pressure through all altitudes (it is modeled in 7 exponentially decreasing layers, in the equations given above). Even at heights of 1000 km and above, the atmosphere is still present (as can be seen for example by the effects of atmospheric drag on satellites). 90% of the atmosphere by mass is below an altitude of 16 km. The common cruising altitude of commercial airliners is about 10 km. 99.99997% of the atmosphere by mass is below 100 km (almost all of it). The highest X-15 plane flight in 1963 reached an altitude of 354,300 ft or 108 km. Earth's dry atmosphere, by volume. The mean molar mass of air is 28.97 g/mol. Note that the composition figures above are by volume-fraction (V%), which for ideal gases is equal to mole-fraction (that is, fraction of total molecules). By contrast, figures for mass-fraction abundances of gases, particularly for gases with significantly different molecular (molar) mass from that of air, will differ accordingly in their molar(mole) fraction abundance figures. For example, helium is 5.2 ppm by volume-fraction and mole-fraction, but only about (4/29)* 5.2 ppm = 0.72 ppm by mass-fraction. Mass percentage calculations of Earth's atmosphere. Composition of Earth's atmosphere as at 1987.Dec. The lower pie represents the least common gases that compose 0.038% of the atmosphere. Values normalized for illustration. In general, assuming that the gases act like ideal gases as discussed (so that each molecule occupies the same average volume in the gas as any other molecule), then the total mass m of each particular gas in the atmosphere is its volume-percentage (mole-fraction percentage) V%, multiplied by its particular molar mass (M), multiplied by the total moles of gas in the atmosphere T, or m = V%· M· T. We may sum these m's for all gases to get a total atmospheric mass M = S(V%·M·T) = T·S(V%·M). Any given element's mass-fraction (m/M) in the total atmosphere, is given by the ratio of the element's mass to the total mass: m/M = (V%·M) / S(V%·M). Note that the total mole figure T cancels in this ratio, as do the % ratios. Thus, results for m/M are direct mass-fraction, and must be re-converted to a % mass fraction by multiplication by 100, or else mass fraction by parts per million (ppm) by multiplication by 1 million. The figure given above for the mean molar mass of air (28.97 g/mole) is the convenient summation of S(V%·M), so that mass fractions for individual gases may be calculated simply by multiplying the gas volume fraction in the atmosphere by its particular molecular weight, and dividing by this number, as was done for the helium example above (if volume fraction % is input, then mass fraction % is output). Atom-fraction abundances, if needed, can be calculated but must be corrected for numbers of atoms in the relevant molecule, so helium makes up 5.2 ppm of the molecules in air, but (since most air molecules are diatomic) helium only constitutes about half as many (2.6 ppm) of the total atoms in air. The light spectrum of an electrical discharge in air showing numerous peaks of molecular band emission. 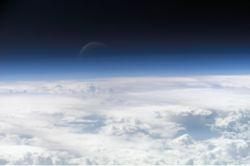 Below the turbopause at an altitude of about 100 km, the Earth's atmosphere has a more-or-less uniform composition (apart from water vapor) as described above; this constitutes the homosphere. However, above about 100 km, the Earth's atmosphere begins to have a composition which varies with altitude. This is essentially because, in the absence of mixing, the density of a gas falls off exponentially with increasing altitude, but at a rate which depends on the molar mass. Thus higher mass constituents, such as oxygen and nitrogen, fall off more quickly than lighter constituents such as helium, molecular Hydrogen, and atomic hydrogen. Thus there is a layer, called the heterosphere, in which the earth's atmosphere has varying composition. As the altitude increases, the atmosphere is dominated successively by helium, molecular hydrogen, and atomic hydrogen. The precise altitude of the heterosphere and the layers it contains varies significantly with temperature. Density and mass of Earth's Atmosphere. Density of air. The density of air at sea level is about 1.2 kg/m3(1.2 g/L). Natural variations of the barometric pressure occur at any one altitude as a consequence of weather. This variation is relatively small for inhabited altitudes but much more pronounced in the outer atmosphere and space due to variable solar radiation. 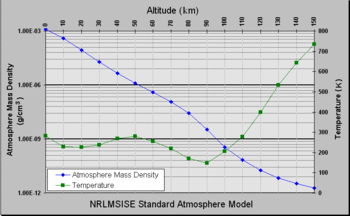 Temperature and pressure against altitude from the NRLMSISE-00 standard atmosphere model. The average mass of the atmosphere is about 5,000 trillion metric tons. According to the National Center for Atmospheric Research, "The total mean mass of the atmosphere is 5.1480×1018 kg with an annual range due to water vapor of 1.2 or 1.5×1015 kg depending on whether surface pressure or water vapor data are used; somewhat smaller than the previous estimate. The mean mass of water vapor is estimated as 1.27×1016 kg and the dry air mass as 5.1352 ±0.0003×1018 kg." Evolution of the Earth's atmosphere. Atmospheric gases scatter blue light more than other wavelengths (see Rayleigh scattering), giving the Earth a blue halo when seen from space. About 4.4 billion years ago, the surface had cooled enough to form a crust, still heavily populated with volcanoes which released Steam, carbon dioxide, and ammonia. This led to the early "second atmosphere", which was primarily carbon dioxide and water vapor, with some Nitrogen but virtually no Oxygen. This second atmosphere had approximately 100 times as much gas as the current atmosphere, but as it cooled much of the carbon dioxide was dissolved in the seas and precipitated out as carbonates. 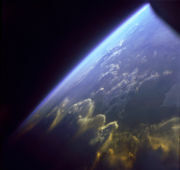 The later "second atmosphere" contained Nitrogen, carbon dioxide, and very recent simulations run at the University of Waterloo and University of Colorado in 2005 suggest that it may have had up to 40% hydrogen. It is generally believed that the greenhouse effect, caused by high levels of carbon dioxide and methane, kept the Earth from freezing. In fact temperatures were probably very high, over 70 degrees C (158 degrees F), until some 2.7 billion years ago. One of the earliest types of bacteria were the cyanobacteria. Fossil evidence indicates that bacteria shaped like these existed approximately 3.3 billion years ago and were the first oxygen-producing evolving phototropic organisms. They were responsible for the initial conversion of the earth's atmosphere from an anoxic state to an oxic state (that is, from a state without oxygen to a state with oxygen) during the period 2.7 to 2.2 billion years ago. Being the first to carry out oxygenic photosynthesis, they were able to convert carbon dioxide into oxygen, playing a major role in oxygenating the atmosphere. Photosynthesising plants would later evolve and convert more carbon dioxide into oxygen. Over time, excess carbon became locked in fossil fuels, sedimentary rocks (notably limestone), and animal shells. As oxygen was released, it reacted with ammonia to release nitrogen; in addition, bacteria would also convert ammonia into nitrogen. But most of the nitrogen currently present in the atmosphere results from sunlight-powered photolysis of ammonia released steadily over the aeons from volcanoes. As more plants appeared, the levels of oxygen increased significantly, while carbon dioxide levels dropped. At first the oxygen combined with various elements (such as iron), but eventually oxygen accumulated in the atmosphere, resulting in mass extinctions and further evolution. With the appearance of an ozone layer (ozone is an allotrope of oxygen) lifeforms were better protected from ultraviolet radiation. 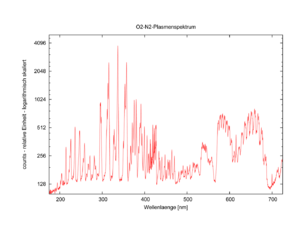 This oxygen-nitrogen atmosphere is the "third atmosphere". 200 - 250 million years ago, up to 35 percent of the atmosphere was oxygen (bubbles of ancient atmosphere were found in an amber). Air pollution is a chemical, physical (e.g. particulate matter), or biological agent that modifies the natural characteristics of the atmosphere. stratospheric ozone depletion due to air pollution has long been recognized as a threat to human health as well as to the earth's ecosystems. Worldwide air pollution is responsible for large numbers of deaths and cases of respiratory disease. 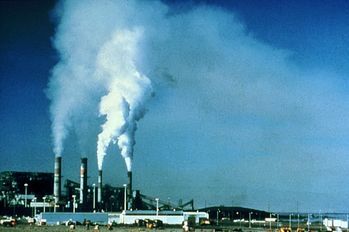 Enforced air quality standards, like the Clean Air Act in the United States, have reduced the presence of some pollutants. While major stationary sources are often identified with air pollution, the greatest source of emissions are actually mobile sources, principally the automobile. 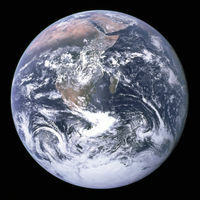 Gases such as carbon dioxide are believed to contribute to global warming and have recently been identified as pollutants. Further reading about the solar system. Solar system related pages. astronomical objects and the solar system's list of solar system objects.